What a great opening song! Check out the lyrics below and enjoy the brilliance of the Donovan Studios as they continue to produce marvelous ASL songs. Then lay out your boards and follow along as Rick Hollander and Dave Kleinschmidt present their After Action Report of Bounding Fire Productions scenario ITR 12 Sosabowski Slapdown that appeared in Into the Rubble 2. We delve into the Critical Hit product Hot Stove 1 in the What's in the Box segment to wrap things up until next time. 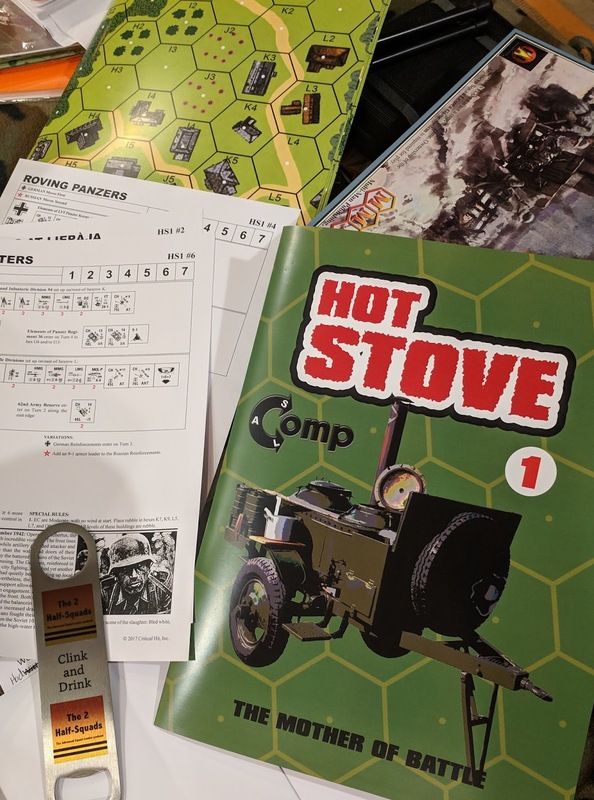 CONTEST: If you would like to win the copy of Hot Stove #1 by Critical Hit simply send us an email with the subject line "Hot Stove" by September 15th, and we will enter you into a drawing for the fine product. Sosabowski Slapdown:Top two photos depict mid game. Playin’ ASL, in the P.T.O. Those Yankee Devils will be stopped! For Nippon he will die! DC Hero Yankees will die! He won’t sur-vive this fight. Gettin to the target will be tough! 45:00 What's in the Box? Thank you for the feedback! We are glad you enjoyed the song. Thanks as always for your enthusiastic support! I'm looking forward to Dennis's album release. I'm hoping that you'll be publishing it on vinyl, not a CD or digitally, because we know that the world is not ready for ASL in digital electronic format - Dan in Vancouver.